The beauty of the hair is often considered as the half of a person’s beauty in total. Having beautiful and above all healthy hair is something we all want. However, this is not always the case and often people have problems with their hair. Many lifestyle and behavioral changes greatly affect the health of our hair. Hair loss is one of the changes with a great impact on a person’s hair. Why hair loss occurs after weight loss? Let’s find out. What Causes Hair Loss After Weight Loss? Hair loss is quite a common problem, perhaps even more common, then you might have thought. If you lose weight rapidly, then the chances of hair loss are even greater. If you drastically change your diet, and if you drastically reduce the number of calories you take daily, then of course, you will have problems with thin hair and hair falling. This problem is particularly common in people dealing with anorexia nervosa. In this case, a nutritional deficiency due to drastic changes and rapid weight loss is the cause of the weight loss. If you are not getting the necessary nutrients your body needs, then normally some defending mechanisms on the body will start working, supplying the important organs and body parts with these nutrients first. Hair follicles don’t belong among the important body parts, so normally they will not get the necessary nutrients needed for healthy hair. Hair loss after weight loss through surgery procedures is also a common problem. Any drastic change in the human body, such as a surgical procedure will cause a certain amount of physical stress. This physical stress will send a signal to the hair follicles to go into a resting phase. If this occurs, then normally your hair will stop growing and even it will start falling off quickly. 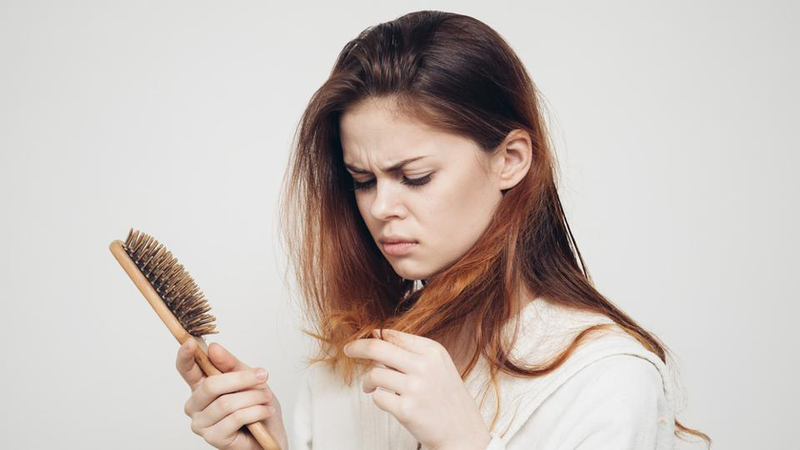 Any change in your hormonal level can lead to hair loss after weight loss as well. After a surgical weight loss, the body will need some time to catch up and get back to normal, especially during the first few weeks of recovery after the procedure. Your hormone levels will need to get to normal as well. This temporary weight loss will be more noticeable during the first month or two, but it can get worse because of vitamin deficiency due to a drastic diet change. Within the first six months after the surgical weight loss, your hair will start growing and glowing again. You only need to be patient and let your own body recover at its own speed. In the meantime, eat as healthy as possible. When Will the Hair Loss Stop? Most people will get their hair back, generally between 6 to 9 months. The hair follicles will need more than 6 months to get from the dormant phase they have entered to the active growing phase. However, sometimes it might take longer and some people will never get their hair back. There are many treatments for hair loss available today, even though many of them have not been proven to cause miracles. The most important thing is to treat the underlying cause that has led to hair loss in the first place. Preventing hair loss is definitely better than to cure it. If you want to prevent hair loss, you should make sure that you are getting enough calories a day. If you want to lose weight, of course, you will need to cut down a little bit, but restricting too much can lead to hair loss problems and many other health problems. If you want to prevent hair loss, then you should get enough proteins with your diet. How much protein you will need each day depends on the body weight or the levels of your activity. If you want to prevent hair loss, then you should take vitamin supplements when trying to lose weight. As you cut down the number of calories, you will cut down some necessary nutrients needed. If you want to prevent hair loss when losing weight you should check your progress by weighing yourself once a week. If you want to lose weight healthy then you should not lose more than 2 lbs. a week. Whole grains, fruits, and vegetables should be part of your diet. Fruits and vegetables are rich in vitamin A, vitamin C, vitamin E, and zinc which are an important factor of hair growth, while whole grains are rich in iron, which when insufficient leads to anemia. Anemia is one of the major causes of hair loss. Vitamin A is an important factor when it comes to hair growth as it promotes healthy skin and the production of oil in the hair follicles. However, too much vitamin A can lead to hair loss. The daily recommendations of this vitamin for men is 900 micrograms, while the daily recommendations of this vitamin for women is 700 to 1300 micrograms. If you consume more than 3000 micrograms of vitamin A daily, vitamin A toxicity will develop which will have a negative effect on your hair follicles. Vitamin B is also important when it comes to hair growth. Vitamin B deficiency is rare but when it occurs it will lead to hair loss. Foods that are rich in vitamin B include eggs, fish, beans, leafy greens, etc. Vitamin C is known for many health benefits. This vitamin is needed for the production of collagen which is a major factor needed for healthy skin and hair. Vitamin C deficiency leads to hair loss as well. Fruits and vegetables, in general, are packed with this water soluble vitamin. Vitamin D is an important factor in the hair growth cycle. The daily requirements of vitamin D are 600 to 800 UI. Exposure to sunlight is a great source of vitamin D. However, milk and cereals are often fortified with vitamin D so we can meet the necessary daily requirements. Zinc is an essential mineral responsible for healthy skin, hair and nails. Many experts believe that zinc has an important role in regulating the protein structure of DNA and RNA responsible for hair follicles. 11 Reasons You're Not Losing Weight?